Hydroseeding is a technique which involves the preparation of a liquid medium that combines seed and a carrier such as wood or paper fibre products with water. Unlike conventional seeding, the liquid is mixed in a hydroseeding machine, with mechanical agitation and recirculation and applied in liquid form to the seeding area. This process can be used to revegetate large and inaccessible areas quickly and is often associated with large restoration and infrastructure projects. Oliver Brown Ltd have exclusive access to hydroseeding industry leading products and promote the ‘hydromulching‘ technique which has a number of advantages over standard hydroseeding & conventional seeding methods. As a result, ‘hydromulching’ has become increasingly popular in the UK. The mixture, sometimes referred to as ‘slurry’, can help to provide a micro climate for the seed and can achieve quicker germination, accelerated growth and increased establishment success compared to standard methods. Hydromulching slurry uses a high concentration of specialist inert organic fibres, tackifiers, biostimulants and fertilisers in order to boost germination and establishment. Seed mixtures can include most species, including tree and shrub seeds. These can all be sown most successfully using hydroseeding; from wildflower seeding and pasture seeding to amenity, sports and erosion control mixtures. Hydromulching achieves the most uniform distribution of each seed type, size and species within the mixture, as the seed is successfully suspended and mixed in the machinery. The use of the hydromulching technique ensures the seed is locked into close contact with the soil or substrate, and is less likely to be washed away by heavy rainfall or affected by climatic changes. OBL undertake soil sampling, site surveys and can create site specific specifications to provide a practical solution for architects, designers and clients. Makes seeding on steep banks or inaccessible areas possible. Reduces hazards for difficult sites and uneven terrain. WHY CHOOSE a hydraulic seeding? Hydraulic seeding methods can quickly save clients time and money, they can be tailored to any site, however extreme to provide site specific solutions. OBL have a wealth of technical knowledge and industry experience with the best machinery on the market. 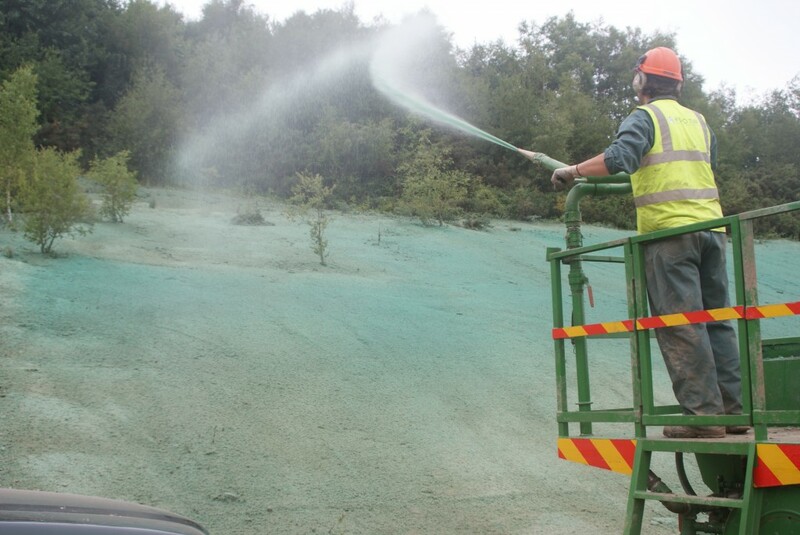 OBL are often commissioned to carrying out hydroseeding works for erosion control purposes using the latest hydroseeding materials on the market. These advantages of hydroseeding helps to save clients time and money by seeding difficult areas that formerly required labour intensive erosion control blankets to be installed, with topsoil spread over and seeded conventionally. OBL use FGM (Flexible Growth Medium) and EFM (Engineered Fibre Matrix) hydroseeding products which provide superior erosion control and rapid turf establishment. Unlike traditional blankets, these specialist erosion control mulch products bond directly to the soil surface, providing a stronger hold and requiring less surface preparation. When installed properly by a professional hydroseeding contractor, these products create an erosion control blanket, effectively ‘locking-down’ the soils, whilst the seed germinates in the mulch. Specific products can remain in place for up to 24 months until the grass is strongly established, and only then will it break down organically. FGM products can be used on saturated areas, and can also be used for dormant seeding during winter or summer. OBL use their wealth of hydroseeding history, knowledge and long standing relationships with mulch manufacturers around the world to deliver a cost effective and professional hydroseeding solution for all site requirements.